SPARKS, Nev., February 1, 2017 (SNC PR) – Under a contract modification, Sierra Nevada Corporation (SNC) will focus on the development of advanced bio-based life support and food production systems for NASA’s Next Space Technologies for Exploration Partnerships (NextSTEP). SNC will continue its public-private partnership with NASA to develop its Hybrid Life Support System (HLSS) for application in microgravity space environments. SNC will work on the development of plant-based modules that can recycle drinking water from waste water streams, regenerate oxygen from carbon dioxide, produce fresh food for astronauts, and support radiation protection of the crew while on deep exploration missions, such as missions to Mars. The development and testing will be done at SNC’s Madison, Wisconsin offices. Plant-growth systems will be critical to the ultimate success of long-duration human missions extending out farther into the solar system. The contract modification spans two years and includes testing to evaluate key technologies with short periods (20 to 30 seconds) of microgravity while aboard an aircraft performing parabolic flight maneuvers. Planned future efforts may include extended testing in microgravity aboard the space station, in addition to tests on Earth. This important effort continues to advance SNC technology and leadership in the development and application of Environmental Control and Life Support Systems that are applicable to long duration human space travel, minimizing consumables. In addition, these technologies have great application on Earth for controlled and closed agriculture systems that can be sustained in dry and harsh environments, or for rapid emergency response food production. 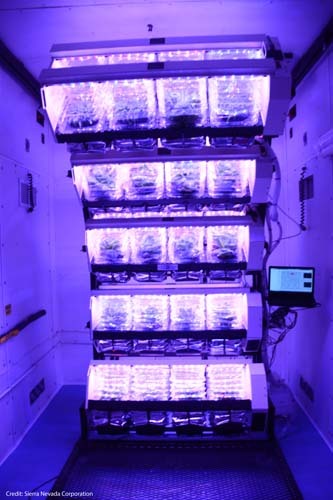 SNC has already provided contributions to advance plant technology on the International Space Station via NASA’s vegetable production system, VEGGIE, and the Advanced Plant Habitat (APH) facility. Fresh food is regularly grown on the space station with VEGGIE, and APH will begin providing important data to better understand plant function in space. SNC is also working on components for a deep space habitat and gateway structure as part of NASA’s NextSTEP-2 development under two other contracts. How about growing algae, plankton and shrimp as well. Russian grew radishes aboard Mir. And they ate them too. Yeah, they have had broad leaf lettuce and some other grow fast veggies that I can not recall. But growing the shrimp will give decent protein. In terms of the shrimp, the water is not really being converted. Simply holding growing food. And with waste recycling, that is water available for all. And it would be interesting to see the impact of radiation and lower Gs on algae, plankton, and shrimp. Take up 100-200 shrimp in different vessels ( say 10-20 per vessel ). If 32 survive ( 16 males, 16 female ), then it is good. If at least some survive, bring up more until you have a minimum of 32. Then.raise them until about 1000 exist to figure out how they do. Not really. I suspect that the shrimp will be fine in the water. Similar density. As such, that should actually cushion them through most of the launch. ISS crews are pretty experienced playing with liquids. Water’s surface tension makes it pretty simple, and having glove boxes and “wetlocks” deals with accidental splashing. The hard part of micro-g is pumps and filtration. Eg, how do you consistently oxygenate the water? Launch hasn’t caused issues with previous experiments. But fish (I don’t know about crustaceans) haven’t done well in micro-g; they suffer similar symptoms as humans (bone-loss, etc) but much, much faster. Which is really interesting, IMO, because their stress/movement environment doesn’t change anywhere near as much as surface vertebrates like mice. They are neutrally buoyant both on the ground and in space, and the drag from water doesn’t change, so the work load on their bones should be the same. That suggests the mechanism for bone-loss isn’t from changes in loading, etc, but comes from changes in fluid distribution or some even subtler effect like intracellular orientation.